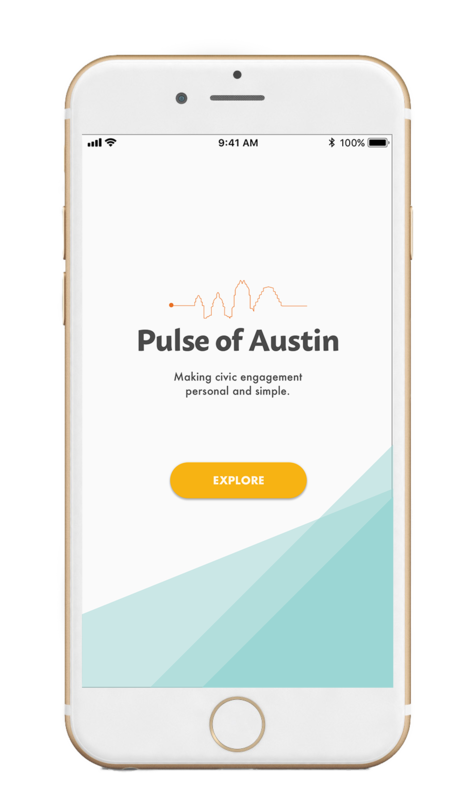 The Pulse of Austin is a mobile app to support civic participation in Austin, Tx. 1. Lack of basic civic knowledge leaves residents unaware of civic functions and discourages engagement. 2. The time it takes to engage with the city through the existing channels feels unreasonable for most residents. Our vision is to create a world in which local governments and people collaborate to shape their cities. Our theory is change is that once people become aware of how the city works, they will start to understand their place within it. Then by gaining basic civic knowledge (like how local government is set up and how decisions are made), people will begin to feel confident enough to join the conversation. If it was easier, or even enjoyable, a larger number of people will make participating in civic life a regular practice. The city will hear from far more and different voices than they ever had before, and be better set up to create policy that addresses resident needs. The last piece is that we hope to flip the script. Instead of the city getting confirmation from residents on projects and policy, residents will start to drive new initiatives. Next, I sketched out what some of the screens might look like to see how the core features would manifest. 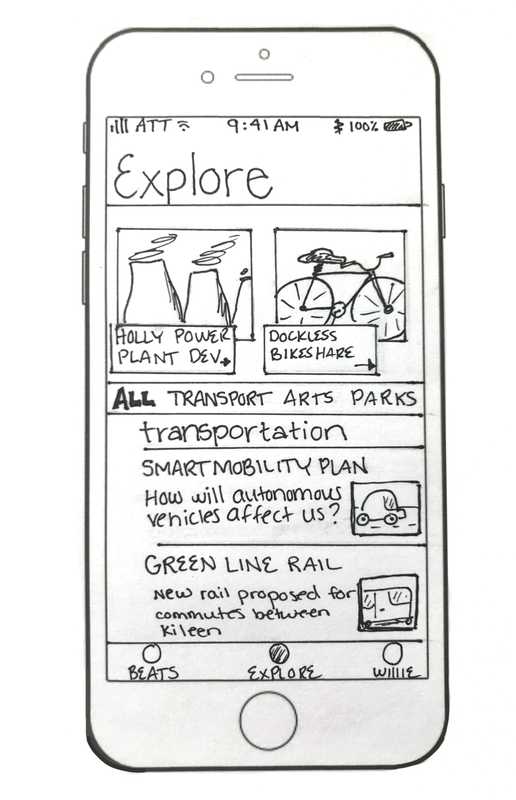 Sketching is always the step prior to going digital, and I like to sketch in flows and not just single screens. 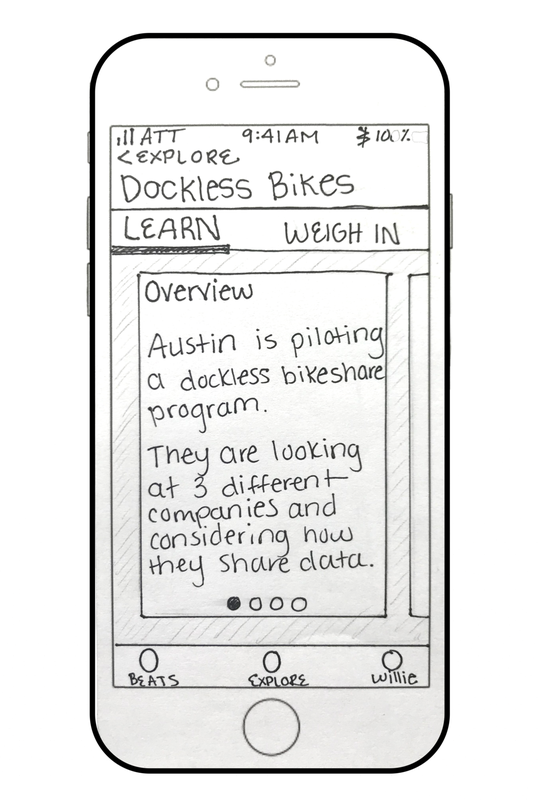 Besides being a quick and cheap way to get share your thoughts with a team, sketching illuminates new questions on how to structure information on a screen. 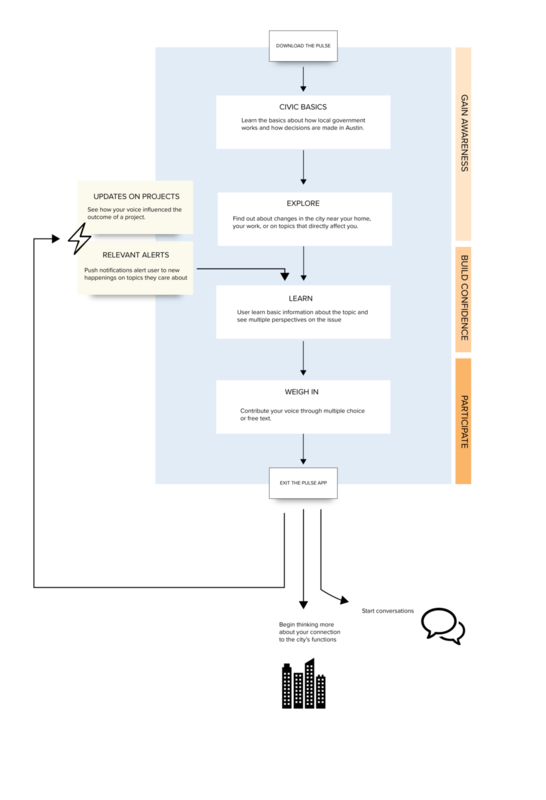 Prior to creating any wireframes, I sketched out a concept map of the system's architecture in order to understand how the different parts and features connect and relate to each other. The IA changed multiple times throughout this project, and was an essential artifact to reference when creating screens. In order to achieve our vision, the heart of the app contains the following core features that we believe provide residents with the most value to becoming civically engaged. In order to test this concept in it's current state (before investing in development) my partner and I put out an ad on Facebook to gauge interest. Those that signed up received text messages that simulated the experience of the app. Just like an alert from the phone, the text would arrive, and users could read a small amount of information and ask to learn more. Lastly, they could offer their thoughts and vote on issues. We started off with using Google Voice to send messages, but it became hard to manage as our number of testers grew. Instead we created a workflow using Airtable, Twilio, and Textit, which has the capability to create logic flows. With a test group of 40 people, the results were really positive and confirmed the beginnings of our theory of change. The messages sparked conversations and an interest in civic happenings in Austin. On average all of testers said they shared The Pulse with 5 other people. Since the response to the test pilot was so positive, we decided to move forward with building it. 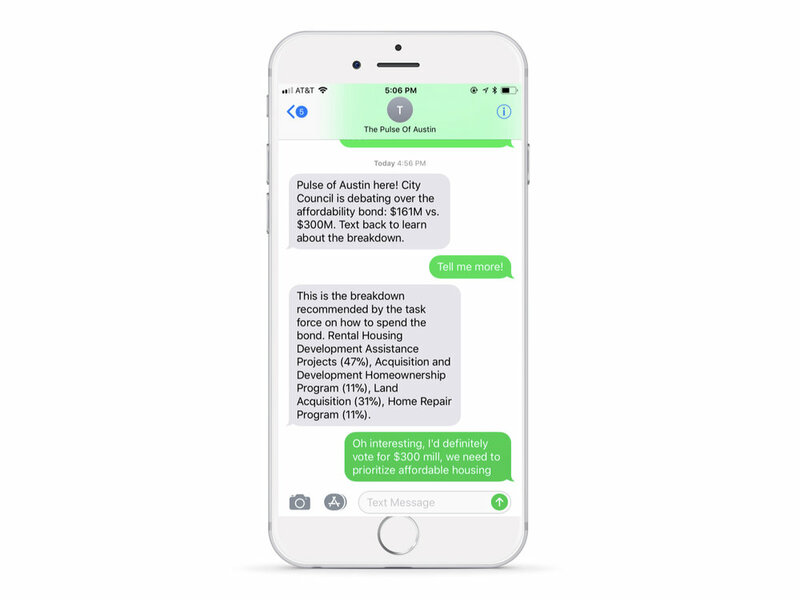 Through the help of civically minded volunteers we met through Open Austin and ATX Hack 4 Change, we have a small team of people helping to bring the platform to life.